Santamania London Dry Gin is the creation of Madrid-based Santamania Distillery, one of only a few micro-distilleries in Spain. Its gins are produced in small batches of no more than 1,000 bottles. The base spirit is made from Spanish Tempranillo grapes. 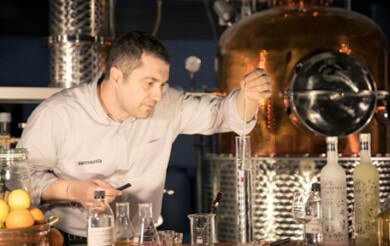 14 botanicals are added before distillation takes place in copper stills named 'Lola' and 'Vera'. ​After distillation, the spirit is hydrated with water from Tenerife's Teide volcano, aged in French oak barrels and rested in the Santamania Distillery's stone cellars.